13: What Lessons Can Be Learned from the Sad Stories of “IRS Compliant” Australians Shaun and Mary? 25: Let’s Fix the Australia/US Tax Treaty! Thanks for that link, Alby. Former US ambassador Niels Marquardt, who is now chief executive of the American Chamber of Commerce in Australia, said territorial treatment of companies should extend to individuals. That is, both should only be taxed in the US on money earned in the US. Finally – here’s the last in my Investment Constraints series. In this post I talk about how to avoid PFIC treatment by investing in the US (even from an Australian brokerage account), and wind up with a quick discussion of record keeping. If you’d like to be more involved, the post lists several ways you can help. Unfortunately every single sentence in the Bloomberg piece is explicitly attributed to the FT – thus making it clear that Bloomberg is only reporting it as a “What the papers say” item. I have my CLN, but worry my kids now. I don ‘t put it past Chump to send my children to war in a draft. There seems to be something wrong with the link, Karen. I’ve been asked to pull Aussie’s story down for a week. It will be back. Call to Action – There’s a provision in both the House and Senate versions of the tax reform bill that could be interpreted as taxing the retained earnings of foreign (Australian) corporations owned by US taxpayers. We do NOT believe that this is what Congress intended – but there are a couple of Canadian tax advisors who think the literal interpretation would unfairly tax all owners of foreign corporations. We have written a letter to Malcolm Turnbull, Scott Morrison, and Julie Bishop explaining what the Australian government can do to help Australian small businesses caught by this trap. 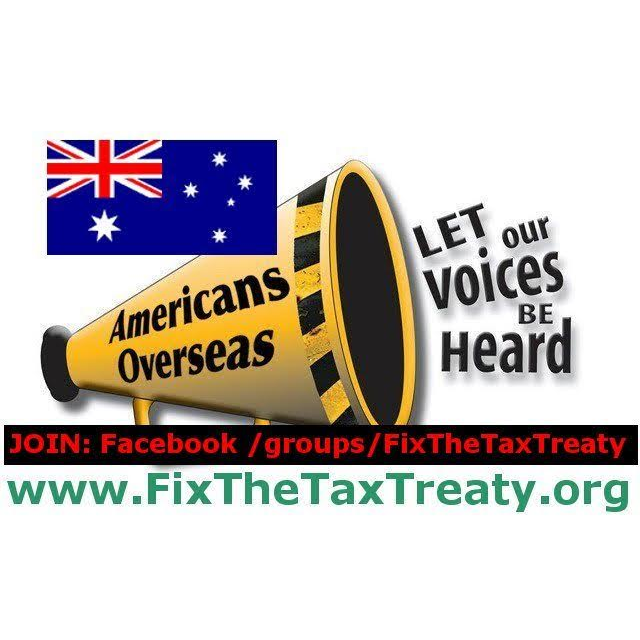 We’re asking US-tainted Australians to send a copy of our letter to their MP and Senators, asking them to get a response from the PM, Treasurer, and/or Foreign Minister as to how Australia will protect it’s citizens and residents by using the treaty to ask the IRS to agree that Congress did NOT intend for individual shareholders to pay the transition tax. In the blog post you will find the letter along with a longer explanation of the issue and an anonymous survey to record which MPs and Senators have received our letter. New blog post at http://fixthetaxtreaty.org/2018/02/03/from-little-things-big-things-grow-annual-report/ – listing our objectives and accomplishments for 2017. So… under the FATCA agreement with the US, the ATO sent data to the IRS on up to 6% of the financial assets of Australian households and businesses (excluding superannuation assets) at 31 December 2016! Somewhere between 2/3 and 3/4 of the accounts reported were owned by Australian residents. And there’s no way to know whether the benefits received by Australia (in the form of reduced tax evasion from accounts reported to the ATO by the IRS – and other governments in future years) outweigh the costs to the Australian economy of setting up the compliance systems that support the increased level of international financial “transparency” under FATCA and CRS.